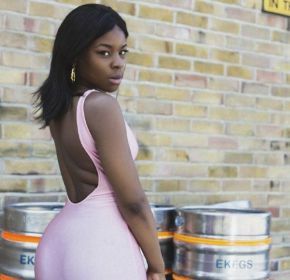 ‘So Right’ is the brand new offering from South East London singer, songwriter and musician LAOLU, and the third and final single to be released from her long-awaited forthcoming EP All In Me. It comes on the back of the recently released ‘How To Feel’ and EP title track ‘All In Me’, which have seen Laolu garner strong support from Clash Music, BBC 1Xtra, PRS For Music, The Line Of Best Fit, Earmilk, Nation Of Billions, and Noctis Magazine, among others. In sharp contrast to the dark and moody ‘All In Me’, which detailed her battle with depression, and the sweltering R&B track ‘How To Feel’, ‘So Right’ is an infectious and uplifting jam about finally being happy and feeling right about it. The record builds on exquisite acoustic guitar arrangements to start, before blossoming into a lush and expansive drums-backed summer offering, held together by the honest, candid and relatable songwriting, and brilliant vocal performance, which we’ve come to expect from Laolu. Speaking about the inspiration for ‘So Right’, Laolu says, “on ‘So Right’, I sing as though I am confessing my love for a partner, but I’m also singing to myself, I sing to the emotion of happiness as if it’s a person, because for me, who didn’t think I’d ever feel or be truly happy, this emotion was very alien to me. It was something I was not sure could happen to me, me being fulfilled and confident in myself again, I didn’t see that for myself. So now, I celebrate that I am on this journey and I make sure that I learn and enjoy my experiences”. Going a bit deeper about what the song means to her, Laolu adds that, “‘So Right’ is a song about being truly happy, nothing more, nothing less. After battling depression and slowly building myself up again, I had a moment after writing ‘So Right’, where I felt a release, the baggage of that time had slowly lifted, without me realising. I was back doing what I love, being honest with myself and building myself and I felt truly happy. ‘So Right’ is about feeling full of love in every way and I hope everyone will feel that and enjoy the song”. With her All In Me EP set to be released at the end of August, Laolu has been having an exciting 2018, which is such a far cry from where she was barely three years ago, when she was battling depression and had to quit music. From working with Katy B, Little Simz, Blinkie (Major Lazer, Wretch 32, Lana Del Rey) and P2J (Stormzy, Tinie Tempah, Chris Brown), and opening for Chip, Ms. Dynamite and Ghetts, and to have all of that stripped away, her well-received comeback this year, has been all the more sweeter for the London native.